Artsreach is an Arts Award Supporter! Our programme features work from national and international performers, diverse companies, and work from both established and emerging performers. Artsreach tickets are excellent value with a concession for under 18s – we want to see more young people at our performances! Many of our events feature a post show Q & A or pre show workshops – please ask for more details! We love to receive reviews of shows from our audiences. Young people can give short reviews via email, or on social media via Twitter and Facebook – we particularly love to see post-show video reviews! Artsreach is also an Artsmark Partner! As an Artsmark partner we support educational establishments on their Artsmark journey to embed arts and culture across the curriculum. We aim to engage and build new audiences through schools and families, and develop deeper and longer term relationships with education settings, understanding their needs and priorities. 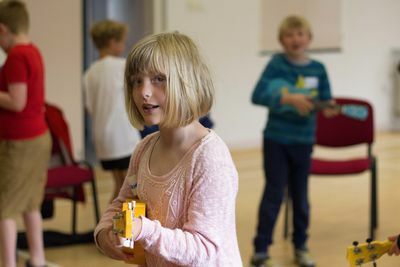 We can offer schools workshops as well as visits to exhibitions and performances, giving children and young people that vital opportunity to learn through the arts and develop their creativity.